Today we decided to have a lazy day, so all we have really done is visit the Visitors Centre and swim and relax by the pool. So I thought I would share some information about the park I have just learnt. Kakadu National Park covers an area of 19,804 km2 (7,646 sq mi), extending nearly 200 kilometres from north to south and over 100 kilometres from east to west. It is about one-third the size of Tasmania, or nearly half the size of Switzerland. The Ranger Uranium Mine, one of the most productive uranium mines in the world, is surrounded by separation from the park. Over the years there has been quite a lot of controversy regarding the mines location and effect on the environment. Aboriginal people have occupied the Kakadu area continuously for at least 40,000 years. Kakadu National Park is renowned for the richness of its Aboriginal cultural sites. There are more than 5,000 recorded art sites illustrating Aboriginal culture over thousands of years. 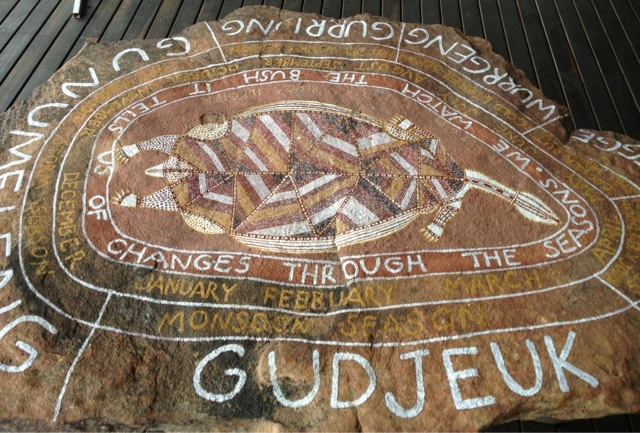 One thing I didn't know was that Kakadu's Aboriginal owners recognise six different seasons. 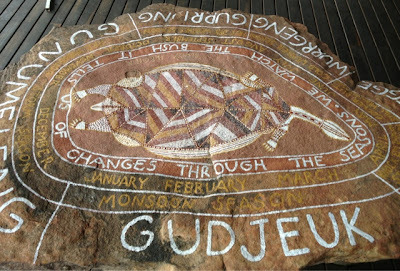 Gudjewg, from December to March, can be described as the 'true' wet season. It is a time of thunderstorms, heavy rain and flooding. The heat and humidity generate an explosion of plant and animal life. Spear grass grows to over two metres tall and creates a silvery-green hue throughout the woodlands. Magpie geese nest in the sedgelands. Flooding may cause goannas, snakes and rats to seek refuge in the trees. Eggs and stranded animals are a good food source for Bininj/Mungguy during this time. Gunumeleng, from mid-October to late December, may in fact last from a few weeks to several months. It is the pre-monsoon season of hot weather that becomes more and more humid. Thunderstorms build in the afternoons and showers bring green to the dry land. As the streams begin to run, acidic water that washes from the floodplains can cause fish to die in billabongs with low oxygen levels. Waterbirds spread out as surface water and new growth become more widespread. Barramundi move from the waterholes downstream to the estuaries to breed. This was when Bininj/Mungguy moved camp from the floodplains to the stone country, to shelter from the violent storms of the coming wet season. So that means we are in Wurrgeng | Cold weather season - so I ask you why am I sitting here typing this post in a sarong with perspiration running down my back?? Very interesting and makes a lot of sense having 6 seasons here. The Aborigines must have been and still are I am sure, very 'fined-tuned' into their environment. Fascinating.